The group that I do crafts with made wreaths a couple of weeks ago. Both my daughters helped me choose the flowers. The teen liked the black flowers and the baby liked the purple. 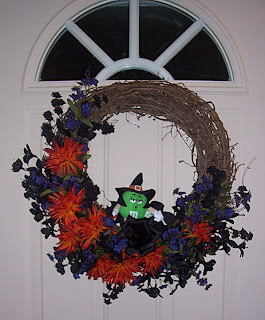 With Halloween right around the corner, and black and purple as a start, I added the orange flowers to make it a Halloween wreath. It's not quite finished, yet. I want to put a big bow at the top with a witch hanging down. I'm thinking I want the bow to be purple, but I want to make sure the color looks right with the witch. Trouble is I haven't found a suitable witch anywhere. I've looked at all the craft store and the big discount stores. There are a couple more places to look, but I'm shocked that no one has little witches this time of year.